For other uses, see Pinch (disambiguation). 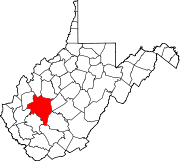 Pinch is a census-designated place (CDP) in Kanawha County, West Virginia, United States. The population was 3,262 at the 2010 census. The community was named after nearby Pinch Creek. Pinch is located at 38°24′23″N 81°29′5″W﻿ / ﻿38.40639°N 81.48472°W﻿ / 38.40639; -81.48472 (38.406348, -81.484682). According to the United States Census Bureau, the Pinch CDP has a total area of 3.6 square miles (9.3 km²), of which, 3.5 square miles (9.2 km²) of it is land and 0.04 square miles (0.1 km²) of it (1.13%) is water. As of the census of 2000, there were 2,811 people, 1,138 households, and 869 families residing in the community. The population density was 801.4 people per square mile (309.2/km²). There were 1,194 housing units at an average density of 340.4/sq mi (131.3/km²). The racial makeup of the community was 99.22% White, 0.14% African American, 0.21% Native American, 0.04% Asian, 0.07% from other races, and 0.32% from two or more races. Hispanic or Latino of any race were 0.50% of the population. There were 1,138 households out of which 32.5% had children under the age of 18 living with them, 64.7% were married couples living together, 9.2% had a female householder with no husband present, and 23.6% were non-families. 20.9% of all households were made up of individuals and 7.0% had someone living alone who was 65 years of age or older. The average household size was 2.47 and the average family size was 2.85. The community's age distribution is 22.1% under the age of 18, 7.3% from 18 to 24, 29.3% from 25 to 44, 28.6% from 45 to 64, and 12.7% who were 65 years of age or older. The median age was 40 years. For every 100 females, there were 93.6 males. For every 100 females age 18 and over, there were 92.5 males. The median income for a Pinch household is $46,516, and the median income for a family was $55,848. Males had a median income of $40,456 versus $35,203 for females. The per capita income in Pinch is $21,398. About 6.0% of families and 5.9% of the population were below the poverty line, including 5.5% of those under age 18 and 19.9% of those age 65 or over. Saint Andrew Nursery School provides WV Pre-K preschool services. Kanawha Valley Regional Transportation Authority or KRT provides bus services north through Pinch to Elkview and Clendenin or South through Pinch to Charleston, and from there to several other places throughout the Kanawha Valley. Pinch is home of Indian Lake, a man-made lake specifically created for fishing. It is stocked with rainbow trout and channel catfish It is also home to what is locally known as the Gazebo, a public theater where performances, pageants, and other community events are held. It has also been holding a town reunion for nearly 70 years. Most recently, in 2016, a public fair was held in the town. Every year, on Christmas Eve, a Christmas parade is held where community members will drive along the Main Street of town at dusk, most notably, the Volunteer Fire Department. A historical resale building on the Main Street of town has a cannon in front of the building. .
^ Kenny, Hamill (1945). West Virginia Place Names: Their Origin and Meaning, Including the Nomenclature of the Streams and Mountains. Piedmont, WV: The Place Name Press. p. 489. ^ "West Virginia Pay Lakes". Retrieved 2010-10-31. This page was last edited on 12 May 2018, at 15:30 (UTC).